SOCIAL: Game Night with Madison FemDev at PerBlue! 4th Annual Galentine'­s Day Celebration! SOCIAL: Revel Craft + Drinks Hour! WiT at the Planetarium: Solar System Update! 3rd Annual Galentine'­s Day craft social! Special Edition September Town Hall @ 100State! Madison Women in Tech is a supportive community of women and gender nonbinary folks working or interested in technology, from designers to programmers to recruiters to students. Through regular events and a digital newsletter, we empower and elevate women working in Madison’s tech scene. 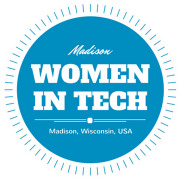 Sign up for our semi-monthly newsletter via http://subscribe.madisonwomen.tech, featuring community events, WiT news, volunteer opportunities and job openings. Follow us on Twitter at @Madison_WiT and find us on Facebook. Any woman or nonbinary person interested in or working in technology is welcome at ALL of our events. Men are welcome at most of our events, but not all - the occasions when are events are specifically for women and nonbinary folks, we will make it clear in the event description. Unsure if it's OK? Feel free to shoot us an email at admin@madisonwomen.tech and double-check (we're very nice). We aren't often able to provide dedicated childcare, and some of our events might not be appropriate for children (depending on their age), but we try to choose event spaces that are child-friendly. We highly encourage you to bring your children along! With rare exceptions, all our events are hosted at accessible locations located near multiple public transportation options; we also try to include information in individual event descriptions re: availability of gender neutral bathrooms. When food is involved, we make sure to have items available for vegan and gluten-free attendees.